As very few of you know, because our assembly was sort of swallowed up as a part of our Congress last year in a small meeting in the middle of a much bigger meeting, I became the Forward in Faith President. It was a certainly an honor to be able to step into this position but I assure you that, as I said when I succeeded a Rector who had been in our parish for twenty four years and then left through death rather than through retirement, I couldn’t replace him. I could only help try to fulfill the function that he did and I’m certainly not replacing Bishop Ackerman but I am trying to fulfill the responsibilities that he undertook as President. So thank you and I’d like to talk about this first year of being your President and where we are now in the context of the Congress. The Congress was a labor to which Forward in Faith committed itself early on, many years before it actually took place because after 2006, in the years and the next decade leading up to now, there was a great jurisdictional shift among faithful orthodox Anglicans in North America. There had been certainly some changes going on for the previous thirty or forty years but they became even more marked after 2006, and so what we’ve recognized in all of the things that have happened, which we don’t need to rehearse nationally and internationally, is that Forward in Faith in some ways was being challenged to see itself more in the context of our preceding organization that led to ESA and Forward in Faith, namely the Evangelical and Catholic Mission. In those days we saw ourselves not as primarily trying to deal with jurisdictions but rather to make a witness for the fullness of our evangelical and catholic faith, and so we were primarily a teaching and a witnessing organization. Well, given the jurisdictional changes we recognized that we could now be part of the means by which Anglicanism comes into its fullness, meaning our full Catholic faith and order. As part of that, we wanted to call an Anglo-Catholic Congress for Anglicans internationally and that’s what we were able to do last year. And if you looked at the list of speakers who spoke last year, you found that they were all over the map jurisdictionally, including non-Anglicans, and that’s because our mission is really larger than Anglicanism. It has to do with the fullness of, and the unity of, the body of Christ and our little part of that, as Anglicans, needs to bear that in mind, as we heard in an address at by our keynote speaker a few years ago, Bishop Michael Nazir-Ali. He reminded us that Anglicanism itself is provisional, that is to say it’s not that we’re going to have a special segment in heaven for Anglicans. Anglicanism is meant to serve the glory of God and the building of his kingdom and it came into existence for a purpose and it may well fade out of existence for a purpose, and that purpose is the unity of the body of Christ. And so we were more than happy to invite Antiochene Orthodox speakers as well as others from across jurisdictional boundaries. Next year’s keynote speaker at the Assembly is Roman Catholic; we’re not committed to any one denomination as our goal, rather we’re about the fullness of witness to the faith. That leads me to say this about the membership of Forward in Faith. Michael Howell, our Executive Director, when he gives his report, is going to give you some statistics but let me just ask you for a show of hands how many of you here this evening are in the Episcopal Church? And how and how many of you are in some diocese within the ACNA? And how many of you are in a group affiliated with the Continuing Church and how many of you are none of the above? Peter Kreeft, in one of his great books, reminded us that we’re only going to be doing two things in heaven for which we have any guarantee scripturally and those two things are going to have three objects. I might take exception with him as to the number three, I think there may be more than that, but allowing him the greater weight, he said the two things we’re going to be doing in heaven are knowing and loving. How many of you have been married let’s say more than 40 years, do you know everything about your spouse? And how many of you could say you are widowed? OK, could you possibly say that when your wife, daughter, husband died you were done loving them or knowing them? Love requires eternity and knowledge requires eternity and so knowing and loving is what we’re going to be doing and Kreeft says that the objects of our knowing and loving will be God first of all then others, everyone else and ourselves, when he reveals to us our name which is written on stone, and that’s revealed to us as we read in Revelation. We will know ourselves as he knows us and we’ll get to know others as he does, and because relationships are never finished, that project is eternal. So, knowing and loving… all of that is the focus of how we’re going to be centering our lives in Forward in Faith - on trying to assist and encourage and challenge us to continue to grow in those two practices… and that’s really what I’m envisioning for the next two years of my Presidency. Fr. Lawrence Bausch is President of FIFNA and Rector of Holy Trinity, San Diego, California. I’m happy to present this Vice Presidential report to our assembly, recognizing of course that our President’s always a tough act to follow. But I want to do what I can to bring you up to speed on developments in the Missionary Diocese of All Saints (MDAS), which was birthed by Forward in Faith North America seven years ago next month. 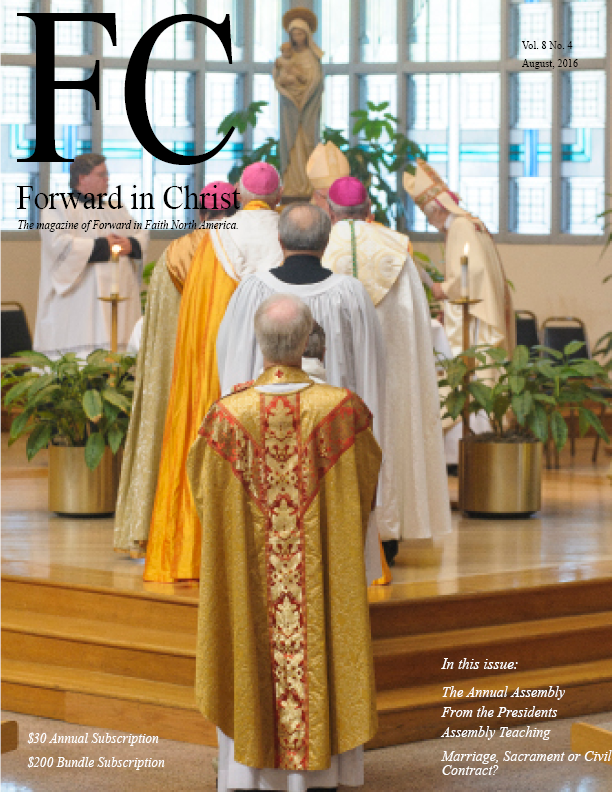 Some of you may know that Forward in Faith worked for many, many years, if not decades, with the goal of having a diocese, a non-geographic affinity based diocese, for those members of Forward in Faith who wish to join it. We’re here, and I was nominated to be the Bishop of that diocese 10 years before my consecration; God has taught me to be patient. Not everyone was convinced that the missionary diocese would succeed but it has. Clearly God continues to bless this diocese which began as a leap of faith and very little else. Over the years we have planted new congregations, most but not all of them continue to grow in faith and numbers. We’ve received into our diocese congregations from other dioceses of the Anglican Church in North America and from other jurisdictions, and when appropriate, we have released congregations to dioceses and jurisdictions deemed more appropriate to their particular circumstances. I think that’s to be celebrated. Now for those of you who do not yet know, our diocese has received a significant number of congregations from the former Diocese of the West, of the Reformed Episcopal Church. These priests, deacons and parishes were incorporated with the full support of their retiring Bishop, Bishop Win Mott, and their Presiding Bishop, Roy Grote. Bishop Win now serves as Vicar General of the Convocation of the West, and is a retired bishop of our MDAS, he is with us for this assembly. Our missionary diocese now extends from the North Atlantic to the Pacific Ocean, from the Gulf of Mexico to the Canadian border. Bishop Lipka’s travel schedule and my own can be challenging to say the least, but by God’s grace and the strength He alone can give, we are up to the call our Lord has placed on our lives. So thank you Bishop Rich, and to the Convocation of the West, welcome. Now I could single out any of our more than 100 priests and deacons, together with their wives, for recognition. All of them are faithful in the exercise of their ministry but having said this there is one priest here, present in this assembly, who deserves our special recognition. He will soon retire as the founding Rector of St. Nicholas Anglican Church in Poinciana, Florida, Father Geoffrey Boland. I now want to conclude my remarks with a point of personal privilege but before I do, I want to tell you what an awesome experience it is for me to serve on the Council of Forward in Faith. More than once over the years, folks have tried to read the burial office over this organization but as Bishop Ackerman has reminded us, we are an organism. And this organism lives for one simple reason, because God wills her to live. With His guiding, we continue to move forward in Christ. Well, to the point of personal privilege. This this year has brought challenges and changes in the life of your Vice President and his wife. In March, it became clear that Lois Jean would need surgery to relieve the pain and restore the mobility she had suffered for more than two years… shortly after her hip replacement, we came to the decision that stairs were no longer our friends and our desire to shovel snow had greatly diminished. So we are moving to a gated 55 and over community in Kissimmee, Florida, just a few minute drive from St. Nicholas church. So to my flagship congregation, fair warning, the Admiral is coming on board! The MDAS has proven her spiritual and financial sustainability over seven years, when a lot of people said we’d never make it. We sustain ourselves on our commitment to the biblical tithe and our congregations do that, and we’re helped by the financial contributions of our friends. Now perhaps you are serving outside of the MDAS but we want you to know, as members of Forward in Faith North America, that we will always consider you to be part of our family. If the Lord moves you at any point, and moves your heart to do, so we appreciate your prayers and your continued support, because by God’s grace we are succeeding. Bishop of the Missionary Diocese of All Saints, in ACNA, and Vice President of FIFNA.